The short-tailed weasel (Mustela erminea) is Colorado’s smallest native carnivore. In summer, this diminutive weasel sports a chocolate brown coat with a light underbelly. In winter, it transforms to pure white except for a black tipped tail. In this white phase, the short-tailed weasel is often referred to as an ermine. A long-tailed weasel in Rocky Mountain National Park. I have now photographed 56 species of the 70 species in my Colorado Mammals Project. Of the 14 species that remain, ten are incredibly rare, if they even exist in Colorado at all. 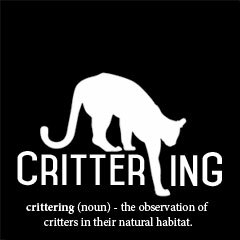 The other four include the recently reintroduced Canada lynx, the Virginia opossum (our only marsupial), the invasive feral pig, and the short-tailed weasel (a.k.a. ermine). It is the winter white ermine that I have set my sights on this winter and hope to photograph next. Despite its tiny size, the short-tailed weasel is a formidable hunter and its slender body allows it pursue small mammals into their burrows. The majority of its diet consists of mice, and voles, but it is capable of taking larger prey including cottontail rabbits when given an opportunity. Like other mustelids, the short-tailed weasel hunts daily to fuel its high metabolism. Contrary to popular belief, weasels do not kill for fun and in the wild surplus food is cached for later consumption. 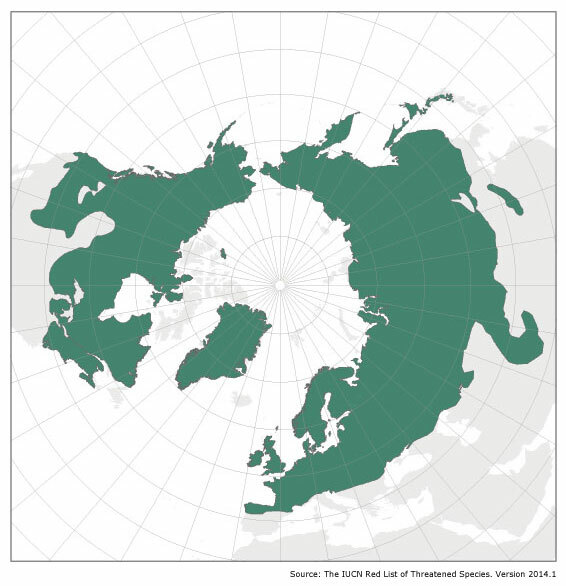 The Holarctic (circumpolar) distribution of the short-tailed weasel. The short-tailed weasel ranges across the northern latitudes of North America, Europe, and Asia in a Holarctic distribution. In the late 1800s short-tailed weasels were introduced to New Zealand by European settlers in an attempt to control the rabbit population (also introduced). The impact on New Zealand’s native ground nesting bird populations has been disastrous. In Colorado, the short-tailed weasel can be found throughout much of the state, particularly in mountainous regions. Data from the Colorado Parks and Wildlife Natural Diversity Information Source (NDIS) suggests that the short-tailed weasel is most abundant in Douglas, Teller, Gilpin, Summit, Lake, and Routt counties. Abundance of the short-tailed weasel in Colorado by county. 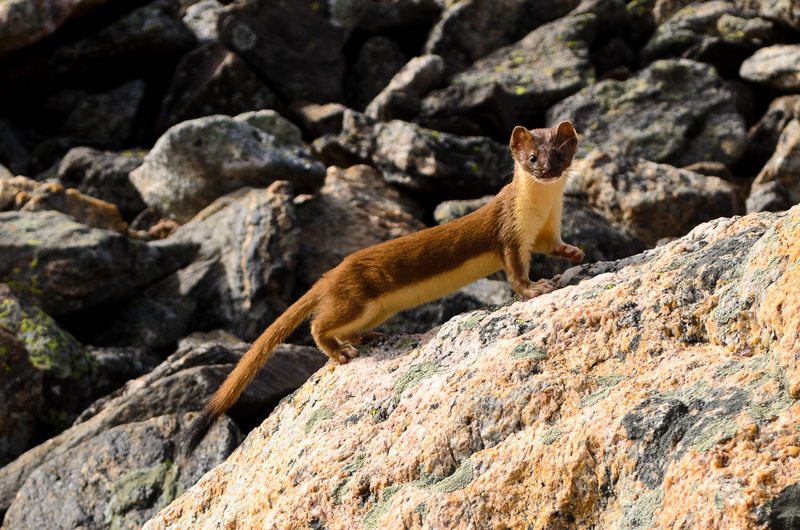 Colorado is home of two species of weasels: the short-tailed weasel and the long-tailed weasel (Mustela frenata). Short-tailed weasels have short tails, and long-tailed weasels have, well, you know. Technically, the length of a short-tailed weasel’s tail is 44% or less of the length of its head and body. Anything longer than 44% and you are looking at a long-tailed weasel. Long-tailed weasels are also about 50% larger, but both species can vary greatly in size and males are significantly larger than females. 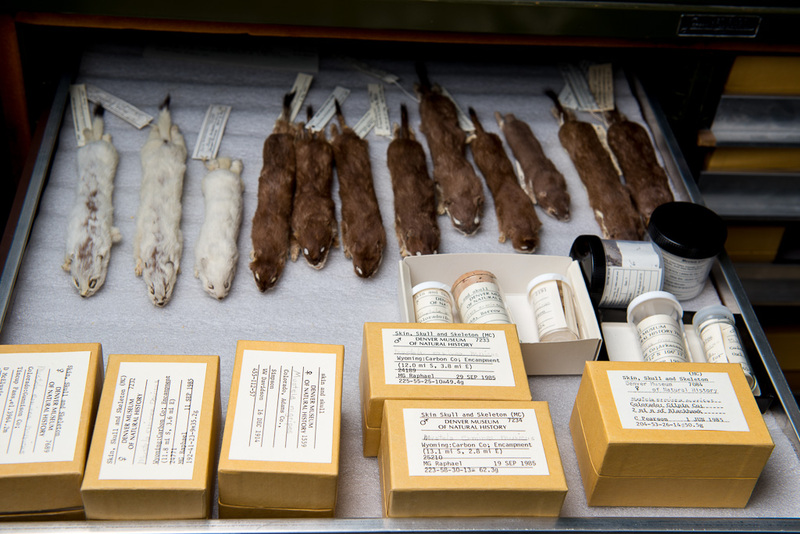 Mustela erminea specimens at Denver Museum of Nature and Science. I have encountered and photographed several long-tailed weasels in the wild. They are most easily seen in the summer months hunting pikas and rodents amongst the talus in locations such as Rocky Mountain National Park. When I have encountered them, I have always been impressed and amused by their boldness and curiosity. I have yet to lay eyes on a short-tailed weasel in Colorado or elsewhere but I have recently observed tracks at several locations that give me hope. Because of their slender body and high surface to weight ratio, weasels easily lose heat to the elements. During the cold and windy Rocky Mountain winter, the ermine spends much of its time tunneling in and under the snow hunting rodents beneath the snowpack. This allows the ermine to save energy, but makes them even harder to observe. 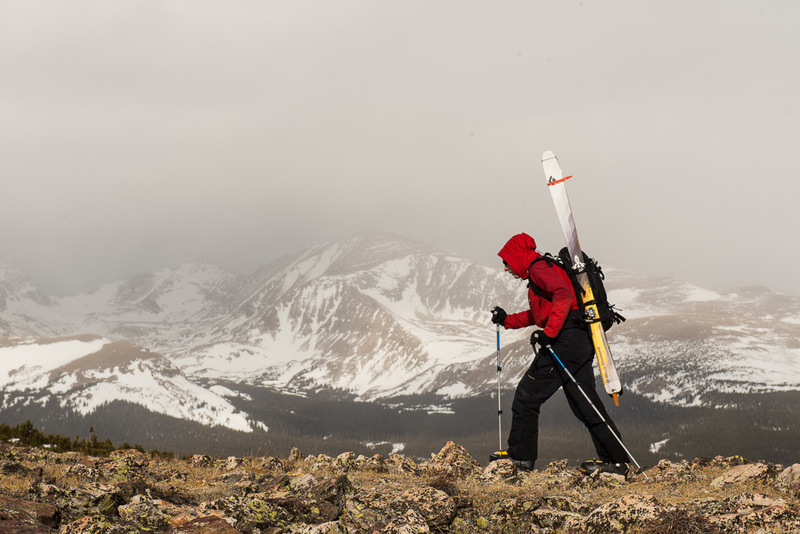 Just another windy winter day on Niwot Ridge. Still, they can be seen ducking and diving in and out of the snow, and with time and patience I believe that I will be able to photograph one. A promising number of skiers I have talked to have seen an ermine while on the slopes or from chairlifts. Arapaho Basin Ski Area even has a run called “Weasel Way”, although I didn’t see any sign of weasels when I was there in December. Nevertheless, I plan to continue my ski based ermine search until I succeed or the snow melts. Our cat just cornered one in our barn and I was able to put on some thick gloves and grabbed it. We are in Ouray County at about 6800′ elevation. Very surprised to see it here. Thing was squeaking and screaming at me and was pretty squirmy, also trying to bike through the gloves so I let it go quickly and it ran under our pile of hay bales. As long as it goes after the hundreds of mice in there, it can stay put. Tried to get it on camera but it was trying to bite me in a big way. Couldn’t do it. I saw one today driving westbound I-70 in thick ski traffic. I was at the top of Floyd Hill when it dashed from the median and was nearly killed by a truck. It ran back and stood on its hind legs in a defense pose. I thought what a badass , and later googled white ferret. I soon learned what an ermine is. I’m a native of Colorado, 48 and love that I can still discover new wild life, even in ski traffic. One showed up in our yard yesterday. We live in a suburban area so was shocked to see it here. Saw an ermine as it ran across the road in our neighborhood in Grand Junction. We had never seen one before- have lived here 15 years. Had a young Ermine running around our back patio and porch this morning. We live about 13 miles out of Montrose at 7100′ elevation. Cool little critter. there is at least one ermine who hangs out in the shed where I keep firewood. curious and sociable little fart! He peeks out at me from under unsplit logs when I am in the room getting logs to split. My cabin has way too many mice so he and any family he has are more than welcome. We saw our first ermine this morning running around our front yard in Monument (El Paso County – elevation 7283.) We were overrun with voles and rabbits this summer, so he should be well fed this winter. Beautiful creature! Having never seen an ermine in the wild I found this while verifying that I saw what I saw. Picking up my daughters on Northgate Boulevard at DCC, one ran across the entry lane and stopped under a parked car. Even though we’re only into fall it was already pure white. I wish I would have been in a position to stop and watch. I love hearing these stories. Glad you got a glimpse of the elusive ermine! Saw my first Ermine today! Pure white with the black tip tail. Had a rodent in its mouth and a Magpie was hot on it’s tail! I live in Frisco, CO about 9,300ft! Saw TWO today in Monument – such cute little critters – all white with little black tip tail; very playful. I just spotted on in Mesa Verde National Park! Only about 3 miles in from the entrance. Fairly close to the Mancos Overlook. Have lived here in Conifer for 42 years and saw my first one today. We are just under 9000′. Saw one this morning on the east side of the Black Forest / Peyton area in my front yard at 7200 feet. He/she went down a vole hole. Very cool to see. I see them hunting along the White River east of Buford, CO. Also have had one live in my wood shed and scold me anytime I begin making noise using the maul to split wood. They seem more curious than afraid so long as they have a good rock or log to duck under for protection. Captured some really good closeups of a snow white ermine in our yard this morning up in Gilpin Co. (Using a Nikon D70s, came out nice!) He/she was poking out from under our porch and seemed unafraid. We’ve actually seen it around several times this winter as there is hardly any snowpack up here at 9000′ 😦 Would love to share the photos with you if you’re interested, but cant find an email contact. We saw 4-6 short-tailed weasels today on our way up to Gray’s Peak. We got good looks and saw them frolic around quite a bit. They didn’t seem that skittish and I believe could be refound as I think their haunts are right along where we saw them and they might be a little too habituated to humans (they seemed to be checking out some sitting hikers to see if they were going to get any goodies. On the other hand, plenty of pika and rodents as well.). If you want to find them, it was right at the juncture of the main gray’s peak trail from stephen’s gulch trailhead, right exactly where the kelso ridge trail branches off. Having hiked in east Bear Creek Park on Colorado Springs’ southwest side for 25 years, I’ve seen a lot of wildlife, but not until November 29, 2018, had I seen an ermine. Adorable! I took two clear images of it with my Samsung—one looking at me, one looking curiously at my husband’s Brittany—both with its tail still underground. Just saw what I think was an ermine scrambling into an old downed tree on our property in Manitou Springs. Is this possible? 6800 ft elevation.